A Gardenalia design consultation begins at your home or project location where you meet for one hour with Gardenalia’s design team. Gardenalia gathers information which they will use to create your design estimate. The consultation is a time for you to combine your vision with the expertise of a Gardenalia designer. Whether you are looking to create a specific feeling or to increase property value in your space our team will capture those ideas and give you a template to make it reality. During this consultation you receive a hearty amount of horticultural and design information.. Similar to a legal consultation, in which you leave with a better understanding of your project whether or not you retain Gardenalia as your install firm. After the design consultation Gardenalia will provide you an estimate for the cost of a custom Gardenalia design. A Gardenalia design is a product in itself, therefore we provide an estimate for the cost in creating it. At this point you can accept the estimate, make a deposit for a design and be placed into our design queue. We are committed to client relationship and interaction at all phases of the design process therefore if you would like to adjust your actual design estimate in scope we are happy to do that prior to you proceeding into the design cue. Customer satisfaction is paramount, a two-way communication process throughout your design and install is inherent to you feeling comfortable in your investment. Once you have accepted your design estimate you are placed into the que and our design team begins discussing your project details. We spend a great deal of time thinking about the materials specific to you needs and budget as well ensuring everyone on the project has a sense of your desired outcome. We will measure your property and then begin designing. The product you receive is an architecturally sound rendering of your property often with every single plant hand picked and placed on your property. 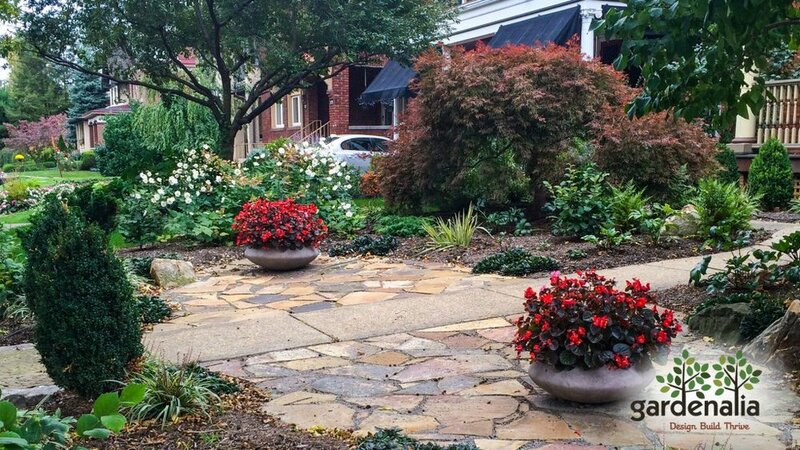 Your design may include a plant list that corresponds with your garden that details with photos how your garden should be performing in each season. We come to your home to deliver the design and spend at minimum another hour discussing in detail the difference material options and design concepts we have put together for you in your garden. We are committed to client relationship and interaction at all phases of the design process, therefore, if you would like to adjust your actual design in scope or have us estimate the project based on installation phased to work within your budget we are happy to accommodate. We are happy to do that as you decide when and how you want to proceed with installation. One of the benefits of hiring Gardenalia for your installation is we can deliver all facets of your design with our own crews and maintaining complete oversight and quality control of implementing your design - we also offer a discounted full year maintenance and fine gardening package from our maintenance division, should you decide to use Gardenalia as your contractor. However you are bound to us, the design that you now own can be installed by you. We also maintain a file of your design and its elements therefore if you want or need us for consultation we are able to provide that for a fee should you choose an installation method other than Gardenalia. Gardenalia has a robust maintenance division and currently maintains many gardens which we have been cultivating for years. As an organic gardening firm, with sustainability as a core, this concept is threaded throughout the entire process. Therefore employing fine gardening techniques that focus on long term health of your garden and the environment is what we specialize in. We have the staff and expertise to maintain your garden on a monthly, semi-annual or seasonal basis.